Intel is passionate about building the future with today’s creators and inventors. For several years, the company has been powering the maker movement by offering a diverse range of development modules that span the classroom to robotics labs. These tools will be brought to life via interactive demos from Intel and its partners at this year’s Maker Faire Bay Area. Visitors to the Intel booth will be given a hands-on experience with a range of Intel modules: from the high performance Intel® Joule™ — targeted at Internet of Things (IoT) developers and entrepreneurs — to the inventor module Intel® Edison. The entry level Arduino 101* (powered by the Intel® Curie™ module) will also be on display; it’s perfect for beginners and classroom educators. 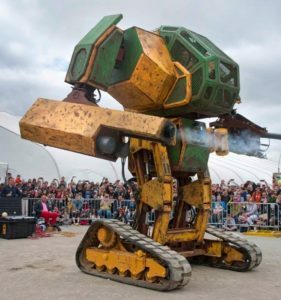 Silicon Valley innovator Megabots, debuting its Mk III Mech, augmented with the Intel® Joule™ compute module and Intel® RealSense™. Industry leader Arduino, a feature in STEM education with CTC kits to make coding in the classroom easy and fun. The interactive jumbo block city designed by Makerologist, where visitors can assemble giant blocks to power a San Francisco city skyline, activating the lights and sounds of the city, even summoning the infamous fog — all powered by an Arduino 101*. Los Angeles-based Aerial Media Production house LA Drone, featuring the LAD Dunk Drone and LAD Virtual Drone activation. In addition, visitors can interact with a selection of Intel® Joule™-powered robots from Maker Collider and participate in hands-on activities using Arduino 101* from MakeCrate, teaching the principles of electronics, engineering and coding, suitable for inquisitive young minds to learn how to build and code circuits. Join Intel at its booth in West Lot near Gate 15 and help build the future. WHEN: Friday, May 19, 1-5 p.m.
Saturday, May 20, 10 a.m.-7 p.m.
Sunday, May 21, 10 a.m.-6 p.m.